Know you not? It was not the only man who can relax releasing tired in hot water baths. It turns out that the monkey was no special place to eliminate fatigue in a hot water bath. The place is in Jigokudani Monkey Park, Yamanouchi, Shimotakai District, Nagano prefecture, Japan. This park is part of Joshinetsu Kogen National Park also known as Shigakogen. Its location in Yokoyu River valley in northern Nagano prefecture. Jigokudani name means "Valley of Hell", because of the hot steam and boiling water from crevices in the frozen ground, coupled with the steep valley, the cold, and the dangers of the forest. Mountain valley at an altitude of 850 meters can only be accessed by climbing about 2 kilometers through the forest. The combination of location and challenging enough to make the journey to this place is not so crowded even though popular among the travelers. This place is famous for the number of Japanese monkeys (Macaca fuscata), or commonly referred to as a snow monkey, who went into this valley during the winter, and foraging elsewhere in other months are warmer. In the warmer seasons of the monkeys used to eat plants, fruits, and insects. These monkeys do not eat meat and fish. When winter arrives, when all the plants die, the monkeys were eating twigs or bark of trees around them to survive. Since 1963, the monkeys come down to the valley to seek warmth during the winter in the onsen (hot springs) which is located on the valley floor, and went back into the forest when the night has come, as quoted from the page of www.cnn.com . Shimokita Peninsula is the northern limit of the Japanese monkey dwelling place located in the northwestern part of the island of Honshu, about 500 km or 310 miles to the north of Jigokudani. No primates can live in an environment colder than this. Cold temperatures can reach minus 10 degrees Celsius. Onsen is managed by a private company, Jigokudani Yaen-koen Inc., with admission per person to 500 yen and 250 yen for students. No holiday period opened all the time 365 days. However different the current opening hours from April to October 08:30 to 17:00 hours, while between November to March between the hours of 9:00 to 16:00. Using a one-hour bus from the train station Yudanaka, Nagano Electric Railway Line Yudanaka. Then a 30 minute walk. When using the car only 20 minutes from junction Shinshu-Nakano on Joshin-etsu Expressway. Caution for motorists, for the winter because it is too cold and heavy snow often in several places were closed. 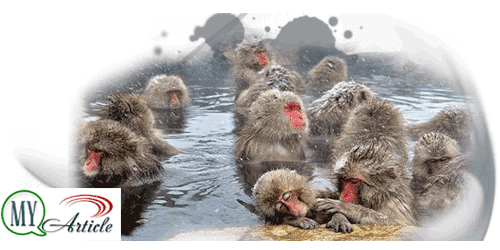 The company was established on June 3, 1964 with a capital of 10 million yen, and since then also performed special onsen bathing monkeys. an awful lot of foreign tourists there just to take pictures of monkeys that relaxing soak in an onsen. Because it is often visited by tourists, the monkeys were docile and relaxed walks among the many tourists that. In 2012 there were about 160 monkeys there. Be careful when near the Japanese monkey because like fun stealing goods that interest them such as glasses or shiny including the camera lens shiny. It is recommended not to touch or approach the monkeys, let alone feeding is not recommended. So you should see it and take pictures with caution. Camera hung fastened to the neck, keeping if suddenly the monkeys come to steal your camera.